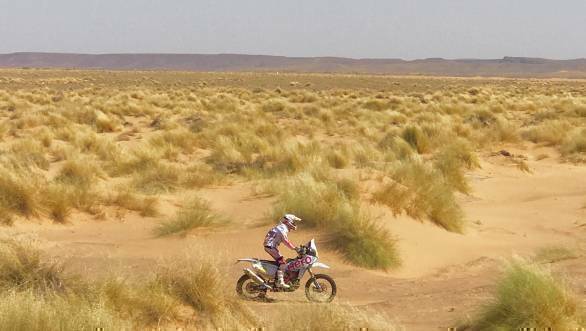 The second stage of the 2017 Afriquia Merzouga Rally was a day of mixed fortunes for Hero MotoSports Team Rally. 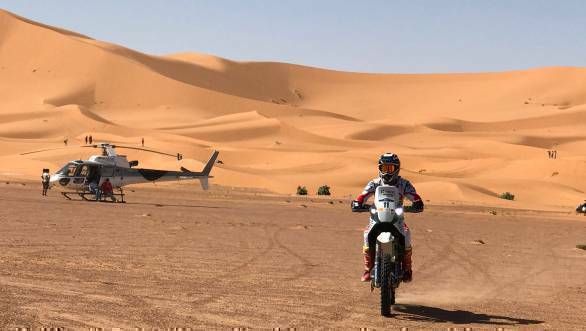 While the temperatures soared and the navigation got trickier, both riders did manage to put in a solid performance over the 188km long Special Stage that ran through the Erg Chebbi region in Merzouga. This, added to the 53km liaison stages, saw the riders contend with sand dunes and dry river bed crossings, all the while trying to find elusive hidden way points, in their quest for the fastest time. It was one such elusive hidden way point that meant that Joaquim 'JRod' Rodrigues, who won the prologue stage for the team, lost time. Though he managed to make up time during the second half of the stage, dust meant that visibility was poor. JRod decided to not risk anything, bring the Hero Speedbrain 450 home safe, and ended the stage in 9th position. This put him 8th overall in the provisional standings at the end of the second day. "Today the start was good and I was aggressive in the dunes to gain time, but around the 50 km mark I lost some time finding the secret waypoint. After the first checkpoint there was a lot of dust and it was hard to attack, so I preferred to keep it safe and bring the bike back home," he said. Meanwhile, things looked up for CS Santosh. 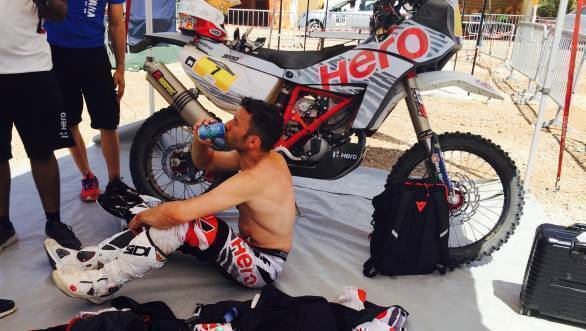 While Santosh had finished the first stage 16th, he rode strong through the second stage and ended the stage 15th. His day wasn't without troubles though. When Santosh came into the first checkpoint, he told his team that there was an issue with his hydration pack, which meant that he'd had to ride all through the morning without any water. Other than that though, he did manage to tackle the navigational challenges rather well, and also went so far as to describe the second stage of 2017 Merzouga Rally as the best stage he'd ever had over the course of his international rally career. 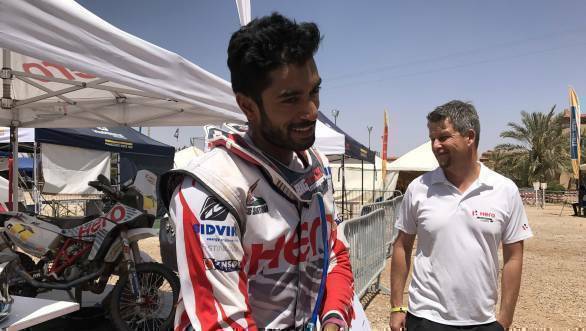 The 2017 Merzouga Rally sees Santosh complete his first year for the Hero MotoSports Team Rally outfit. "Last year everything was new," he said, gesturing towards the motorcycle and the crew that runs the show behind the scenes. "I understand the motorcycle a lot better now. I knew I would eventually bring it all together. I had a good day today, all in all, one year and some good progress." Santosh went on to speak of the progress he's made thus far, saying "To know what to expect in a stage like this is something I understand now. A few years ago it was difficult to understand the complexity of a stage like this. So, I think as the years progress, and I do more rallies, and I spend more time with the motorcycle, I have a better understanding of what's required."